“What in the world is Traynor doing?” I wondered as I entered the recreation room at Bupa Aged Care in Dalton Road. He was down on his hands and knees in the middle of a circle of laughing elderly residents, carers and the other students from the William Ruthven volunteers, for all the world to see behaving like a dog. He quickly explained that he was playing charades. 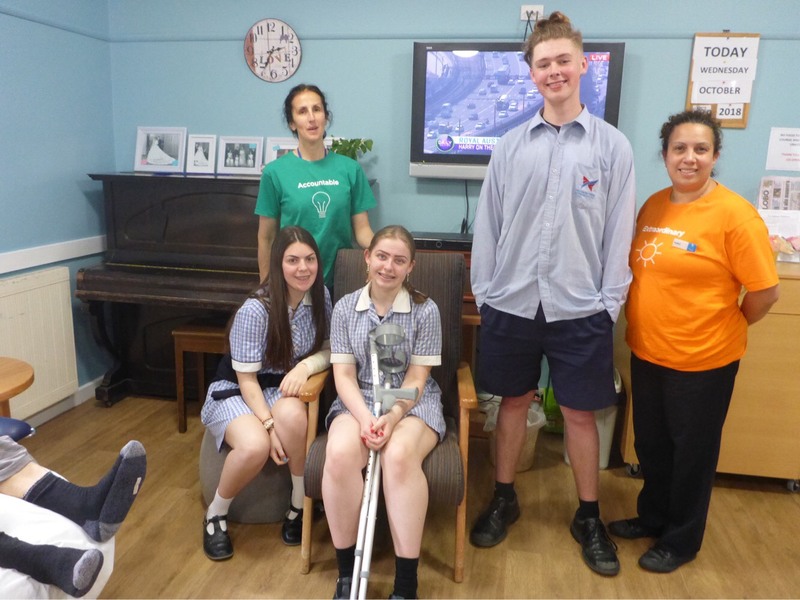 Traynor Traynor-Beaton, Taylah Hall and Olivia Totsis have elected to do their weekly volunteer placement for Y Challenge with leisure program supervisor Angela Perisic. All three students had some experience with elderly family members but none of them had previously taken responsibility for a caring role. At first there was some discomfort felt by our young volunteers. “It was a bit difficult meeting a lot of new people, especially as some of the residents had hearing problems and with others English was not their first language. But we soon got used to it and we are all pretty comfortable with one another,” explained Taylah. For Traynor, the greatest change he has noticed in himself after nearly two months of volunteering, has been how much more confident he feels. These days he is quick to join in and have some fun, whether it’s charades or dancing to the music from the visiting entertainers that are part of the leisure program. “We join in and have a laugh,” he says. One of the reasons that I visit each student is to check that things are going well, both from the students’ and the supervisor’s point of view. Angela Perisic is delighted with the student volunteers and how they are working to enrich her program and the lives of her elderly residents. “They are so friendly, and they are doing a great job,” she says. Of course, our college is also very grateful for people like Angela and the Bupa organisation for opening their doors up to our students and giving them the opportunity to develop their life and pre-employment skills.